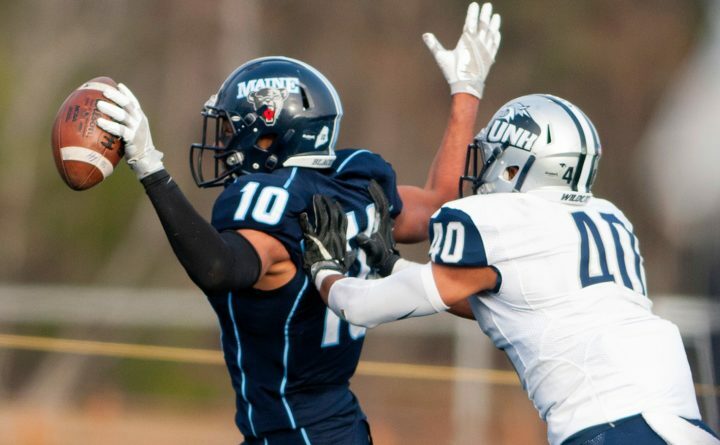 Micah Wright of the University of Maine celebrates as he scores a touchdown against New Hampshire in 2016. The Black Bears and Wildcats meet for the 108th time on Friday night in Orono. The University of Maine football team opened the 2018 season with a 35-7 Colonial Athletic Association victory over New Hampshire at Alfond Stadium. UMaine moves to UNH one but offsides pushes it back to 6. Ferguson throws six-yard TD pass to Micah Wright. Micah Wright fumbles punt but UMaine recovers. UMaine first and 10 at its own 19 yard line. UMaine leads 7-0. UNH QB Trevor Knight injured. Leaves field with shoulder in sling. Knight was preseason CAA Offensive Player of the Year choice. Ramon Jefferson runs 49 yards with a draw down to UNH 11 yard line.